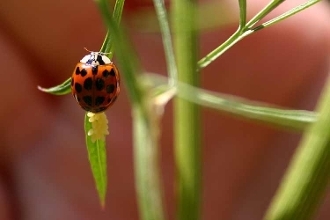 This listing is for random ladybug species in the Order Coleoptera, beetle family Coccinellidae. Ladybugs are sometimes called lady beetles. This listing is for the familiar red or orange ladybugs, some with spots and some without. See related products below for other ladybugs. $2 each or take 10 for $10, or take 20 for $15 or buy 35 or more for fifty cents each. Enter desired quantity in the field below to see these bulk discounts reflected.